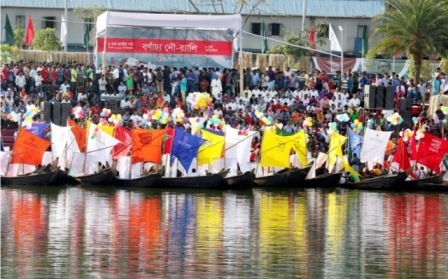 Staff Correspondent: An exciting colorful water rally with 100 traditional boats was held on Saturday, 3 March in the capital's scenic Hatirjheel as part of the government's ongoing campaign to make use of jute and jute products popular ahead of the National Jute Day on March 6. The boats, decorated with colourful festoons and balloons, displayed jute and jute products along with portraits of Father of the Nation Bangabandhu Sheikh Mujibur Rahman and Prime Minister Sheikh Hasina created huge enthusiasm among the spectators. People from all ages flocked on banks of the entire Hatirjheel to enjoy the rare boat rally. Textiles and Jute Minister M Imazuddin Pramanik was present as the chief guest while State Minister for Textiles and Jute Mirza Azam as the special guest. The government has chalked out weeklong programme including rally, road show, art camp, poem festival, seminar and symposiums, started from February 27 centering the National Jute Day. Pramanik called upon all to work along with the government from their respective positions for making the use of jute and jute products more popular in home and abroad. "We have taken various programmes to aware people about the economic benefit of jute," he said and added that the present government is committed to revive the past glory of golden fiber, the pride of Bangladesh. After the boat rally, a buzzing concert was held on the bank of Hatirjheel with lively performance of the country's popular singers. Textiles and Jute Secretary Faizur Rahman and heads of different organizations under the ministry were also present on the occasion.